Inside: Words of encouragement for kids to help them develop a growth mindset. Many of us who have or work with children are committed to equipping them with the tools needed for success. Having a growth mindset is one of the main tools we want to pass on to kids. A growth mindset is the belief that we can accomplish things through hard work and dedication. We want to encourage a growth mindset in children because kids with a growth mindset are better able to face life’s challenges. Research shows that when children with a growth mindset encounter something they can’t do, rather than giving up, they increase their effort and try different strategies. These kids are also able to recognize when they need help and aren’t afraid to access their resources. Furthermore, children with a growth mindset cope better with transitions, are able to self-regulate, and tend to engage in pro-social behaviors. Some studies also found that children with a growth mindset have healthier self-esteem, are less aggressive, and exhibit fewer symptoms of depression and anxiety. One way to help children develop a growth mindset is through using words of encouragement. When used correctly, your words of encouragement for kids significantly impacts their lives. However, despite our good intentions, research indicates that many of us are missing the mark when it comes to using words of encouragement for kids. This is due to us confusing giving children encouragement with giving them empty praises. A significant difference between praise and encouragement is that praise often comes with a judgement or evaluation. Praise tell kids what you approve of and also what behaviors you value. It doesn’t give them an opportunity to figure out what’s important to them. Praise causes children to be anxious and dependent. In addition, it leads kids to be preoccupied with what others think about them. We’ve been conditioned to believe that giving empty praises like “good job” and “you’re so smart”, encourages kids to give their best effort. However, studies show that these praises do little to encourage a child and can in fact trigger low self esteem. This is because when we praise kids for their abilities and personal characteristics, they develop a fixed mindset. Children with a fixed mindset believe their basic qualities, such as intelligence and talent, are fixed traits that can’t change. Kids who have a fixed mindset undervalue effort and hard work. In their minds, you don’t work at being smart. You’re either born that way or you’re not. This leads them to focus more on looking intelligent and talented instead of on developing their abilities. , psychologist Carol Dweck discusses her research findings on fixed and growth mindsets. She explains that children who operate from a fixed mindset equate failure with not being intelligent and lacking talent. This belief makes them vulnerable to criticisms and setbacks. When kids with a fixed mindset mess up, they start doubting themselves. Their self-esteem and self-confidence suffer tremendously. Children who exhibit a fixed mindset play it safe and don’t challenge themselves. For example, they may avoid answering questions in class or trying a difficult problem out of fear they will get the answer wrong. Encouragement on the other hand, focuses on children’s process and the actions they take to reach a desired outcome. Communicating words of encouragement to children helps them develop a growth mindset. When we use words of encouragement to motivate children, they learn to value effort and hard work. These kids approach challenges with confidence and aren’t afraid to take risks. They are more likely to develop a growth mindset because they attribute success to their efforts and not their abilities. Now that we understand the difference between praise and encouragement, here are some ideas of how to encourage kids effectively. Be specific. Giving children feedback such as ‘you’re so smart” or “good job” does little to help them make the connection between their effort and the outcome of their actions. They don’t know what they did that was so good. Aim to be as specific and descriptive as possible. Always focus on their effort and not their ability. When you offer encouraging words to kids, give them feedback on their effort. Discuss with them the strategies they used. Ask them questions about how they completed a task or figured out a problem. Doing this helps children learn that their success is based on their effort and not their abilities. Overtime, this will help them develop a growth mindset. Be sincere. Children are good at recognizing when people aren’t being genuine with them. If they sense that you are only telling them kind words to make them feel better, you might lose their trust. Also, children may become insecure and believe you only tell them nice things because you don’t want to hurt their feelings. It’s best to be genuine when offering words of encouragement to children. Don’t over-encourage. Offering children words of encouragement doesn’t mean you have to sugarcoat things for them. When kids are dealing with setbacks, use their time of struggle to help them sort through their feelings and identify their inner strength. Resist the temptation to offer them feel good phrases such as “It’s OK” in an attempt to make them feel better. Instead, validate their feelings of frustration and disappointment, while encouraging them to brainstorm alternative solutions. 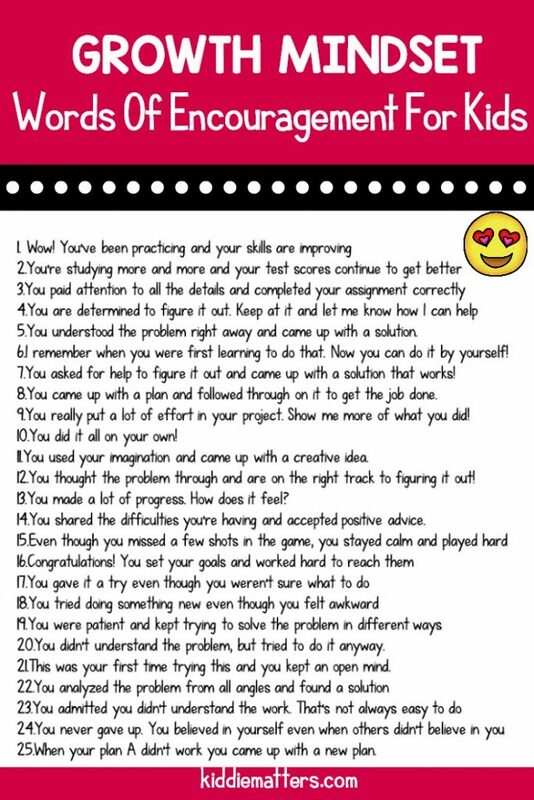 In order to make sure that you are using effective words of encouragement, below are some words of encouragement for kids that you can use to help children develop a growth mindset. You understood the problem right away and came up with a solution. I remember when you were first learning to do that. Now you can do it by yourself! You asked for help to figure it out and came up with a solution that works! You came up with a plan and followed through on it to get the job done. You really put a lot of effort in your project. Show me more of what you did! You did it all on your own! You used your imagination and came up with a creative idea. You thought the problem through and are on the right track to figuring it out! You made a lot of progress. How does it feel? You shared the difficulties you’re having and accepted positive advice. You didn’t understand the problem, but tried to do it anyway. This was your first time trying this and you kept an open mind. You can download a PDF version of this list of words of encouragement for kids when you sign up for our monthly newsletter, the Social Emotional Toolbox. Our newsletter is filled with social-emotional skills activities and resources. 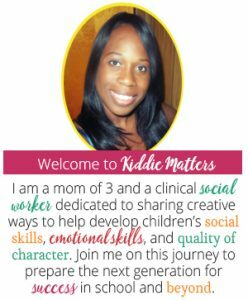 In addition to this PDF, you’ll also gain VIP access to our library of free social emotional learning resources. You can sign up for our newsletter here. Also you can unsubscribe at any time.